My favorite of the Six Pack! Would be cool to see a live show with VHII played in its entirety. 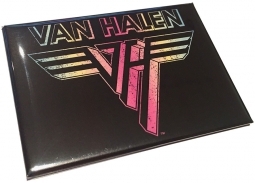 IMO, the most underrated album in the entire VH catalog. Last edited by I Coulda Hada VH; 03.23.19 at 12:55 PM. Freshman year of high school. Damn, I'm old! I love YNG, SGMAD, DTNA, BG, and really dig LUTS; for band tunes. Spanish Fly is pretty insane for a '79 instrumental! Edward was shredding! My 3rd favorite album after WACF and FW. A rare sequel better than the original. The live tones of Ed's guitar and Al's drums on the World Vacation Tour were arguably the greatest live sounds of their career. And Mike was still playing busy and not relegated to root 8th notes on this tour. The full band extended jams they routinely did during FYLT and YRGM on this tour were amazing. YNG is my favorite studio recorded cover in the catalog. It's also my 3rd favorite, behind the debut and FW. It's a killer album, but it is not better than the debut. 3rd on my list as well. Behind FW and WACF. Just an amazing record! Some don't like the production but I think it fits well with the party vibe of some of the songs. VH raw and unfiltered Lighting Up the Studio! The great thing about all the Ted produced albums is all the instruments were allowed room to breathe. Theres been a lot of talk recently about DD being VH's summer album. For me; II is the quintessential VH summer album. Great, great record. My 2nd favourite after Fair Warning. That's Alex Van Halen record, hands down. The band is on fire and Alex is insane on that one, exception made for Spanish Fly. SF is one of their best instrumental piece, much more with the 'NOT again' and the cigar smoke. And the John McLaughlin stuff. Here by Zakk Wylde's words: 'I believe it was in Guitar for the Practicing Musician, or something like that. In fact, I actually told Eddie about it years later. They were doin’ “In the Listening Room” with John McLaughlin. You know, where they bring in a great musician, play him some songs, and then they basically share their thoughts. Well, they play “Spanish Fly” and McLaughlin was like, “Oh, this sounds very flamenco influenced. This guy is a phenomenal player! Who is he?” Obviously, John had no idea it was Ed. I remember telling Eddie and he goes, “Really? He f**kin’ said that about me?” Ed had no idea. John McLaughlin was sittin’ there going, “This guy is phenomenal! He has amazing technique!” I mean, John plays with Paco De Lucia, so I think he knows a thing or two about an amazing sick-a** flamenco guitar player, you know?'. NO WAY! DD is just peeeeeeeeeeeeerfect for summer. I've been telling you this since you 1st joined the CVH board. Lol, yes DD is a great summer album, but so is VHII. Group Thread: Post Your VH1 Covers for the 40th Anniversary! Your ideal 40th Anniversary Tour scenario? Pasadena Monthly Magazine: VH's 40th Anniversary!